Managing a RHEL 7 server, as it is the case with any other Linux server, will require that you know how to add, edit, suspend, or delete user accounts, and grant users the necessary permissions to files, directories, and other system resources to perform their assigned tasks. When a new user account is added, by default the following operations are performed. His/her home directory is created (/home/username unless specified otherwise). These .bash_logout, .bash_profile and .bashrc hidden files are copied inside the user’s home directory, and will be used to provide environment variables for his/her user session. You can explore each of them for further details. A mail spool directory is created for the added user account. A group is created with the same name as the new user account. These two fields [username] and [Comment] are self explanatory. The second filed ‘x’ indicates that the account is secured by a shadowed password (in /etc/shadow), which is used to logon as [username]. The fields [UID] and [GID] are integers that shows the User IDentification and the primary Group IDentification to which [username] belongs, equally. [Default shell] is the shell that is commit to this user when he/she logins into the system. [Group name] is the name of group. Does this group use a group password? (An “x” means no). 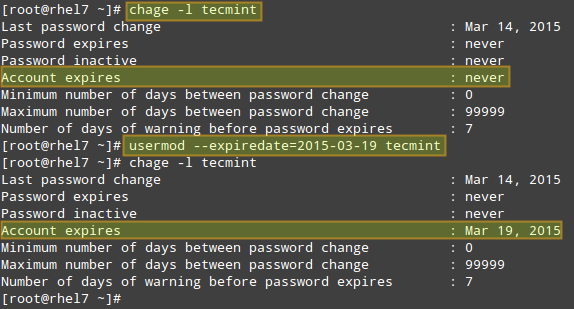 [GID]: same as in /etc/passwd. [Group members]: a list of users, separated by commas, that are members of each group. before and after updating the account expiry date, as shown in the following image. Besides the primary group that is created when a new user account is added to the system, a user can be added to supplementary groups using the combined -aG, or –append –groups options, followed by a comma separated list of groups. If for some reason you need to change the default location of the user’s home directory (other than /home/username), you will need to use the -d, or –home options, followed by the absolute path to the new home directory. If a user wants to use another shell other than bash (for example, sh), which gets assigned by default, use usermod with the –shell flag, followed by the path to the new shell. To remove a user from a group, omit the --append switch in the command above and list the groups you want the user to belong to following the --groups flag. To disable an account, you will need to use either the -L (lowercase L) or the –lock option to lock a user’s password. This will prevent the user from being able to log on. When you need to re-enable the user so that he can log on to the server again, use the -U or the –unlock option to unlock a user’s password that was previously blocked, as explained in Example 5 above. If there are files owned by group_name, they will not be deleted, but the group owner will be set to the GID of the group that was deleted.